Veracruz Mexico is a costal city with a unique historical past. It was here the first permanent European settlement on the American mainland began and also the location of the main port used for the importation of slaves into Mexico. Even though slavery was abolished in 1810, to this day Veracruz boasts a blend of African, European, and indigenous traditions that make it very different from other places in Mexico and gives it a distinct Caribbean flavor. The music and cuisine of Veracruz, called “jarocho,” are distinctive and special mixtures of Caribbean, African and indigenous influences. Many of Mexico’s favorite drinks and dishes were conceived in the bars and restaurants of Veracruz. For partiers, the locals open their town every spring to a frenetic Carnival celebration that rivals Mardi Gras in New Orleans. Attractions include the busy and picturesque “zócalo” in the historic part of the city, the formal name of which is the Plaza de las Armas. At night, locals gather to dance the “danzón,” a 19th century dance brought by Cuban immigrants. The majestic Municipal Palace and the Cathedral are on that main square. 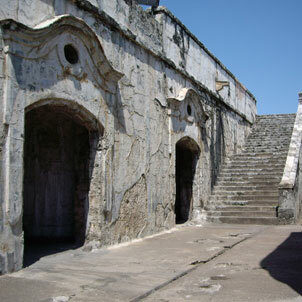 The Palace was built in 1608 and renovated in the 1700’s, the oldest in Mexico. The cathedral, Virgen de la Asunción, was finished in 1731 after being under construction for nearly a century. With its five naves and octagonal, tile-covered dome, it is unusual for sanctuaries in Mexico. Other attractions include the Old Lighthouse on the waterfront and the “Malecón,” a seaside walkway that extends for miles. Nearby is a large Crafts Market. Visitors also enjoy stopping at the Veracruz Aquarium, built in 1992, with its 27 exhibit tanks, with over a million liters of water. The Reef Tank and the Manatee Exhibit are among the most popular. Historic points of interest include the City Museum, the old Fort San Juan de Ulúa and the Heroic Naval Academy. The fort was the Spanish army’s first foothold on Mexican soil, and it was their last stand at the end of the fight for independence. The City Museum is a beautiful, traditional building with exhibits about the history of this oldest of American cities. Another museum is in the house of famed poet Agustín Lara. Ecologists will enjoy the Isla de Sacrificios, whether to observe birds and other wildlife, or to visit the web of 23 coral reefs called the Veracruz Reef System. Veracruz is also famous for its bloody history. The treasures that passed through Veracruz attracted pirates over several centuries and Veracruz came under regular siege. Though the epic of pirates eventually came to an end, the city was also invaded four times by foreign armies: by the French in 1837 and 1864, and by the Americans in 1847 and 1914. Where did Veracruz, Mexico get its name? Hernán Cortéz founded the city on Good Friday in the year 1519. Because of the gold known to be in the area, he called it “Villa Rica” and added “de la Vera Cruz” because it was Good Friday. Vera Cruz eventually became the Veracruz, one of Mexico’s most interesting destinations.